By default, both Firefox and Chrome use the ANGLE layer to render WebGL draw calls under Windows. ANGLE is an implementation of the OpenGL ES 2.0 specification that is hardware-accelerated via Direct3D 9. If, for some reasons (for some Shadertoy demos for example), you want to use real OpenGL draw calls, you can enable native OpenGL in Firefox and Chrome. 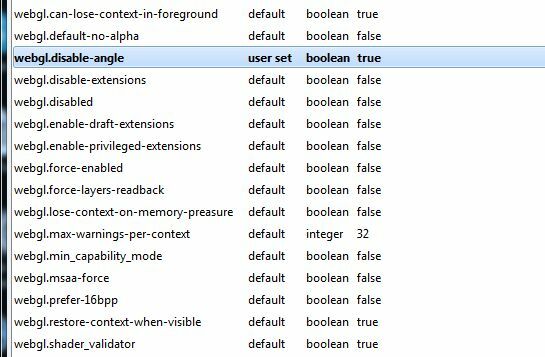 The nice thing with Firefox, is that the new setting is immediately operational. 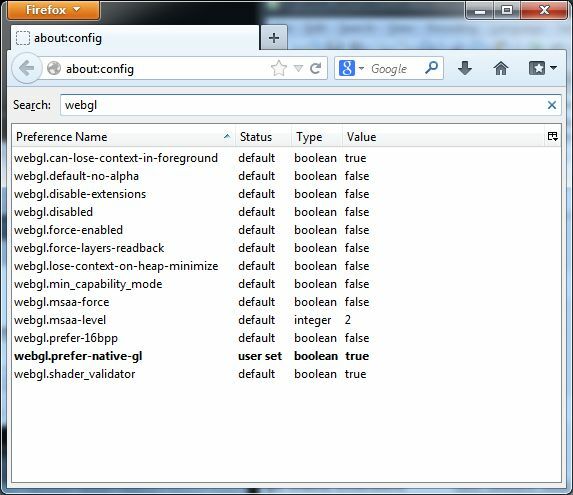 In recent version of Firefox, the webgl.prefer-native-gl variable has been replaced by webgl.disable-angle. 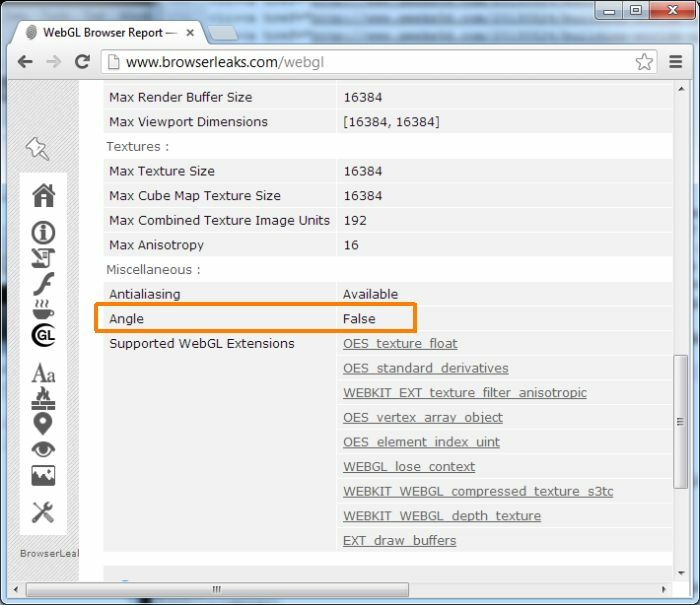 And by default, webgl.disable-angle is set to false: native OpenGL is not used. 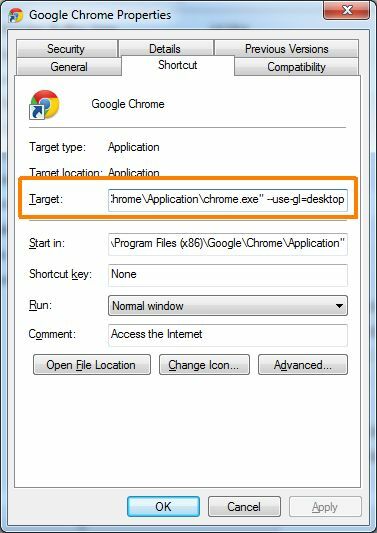 Unlike Firefox, you need to close all Chrome instances to enjoy the new setting. 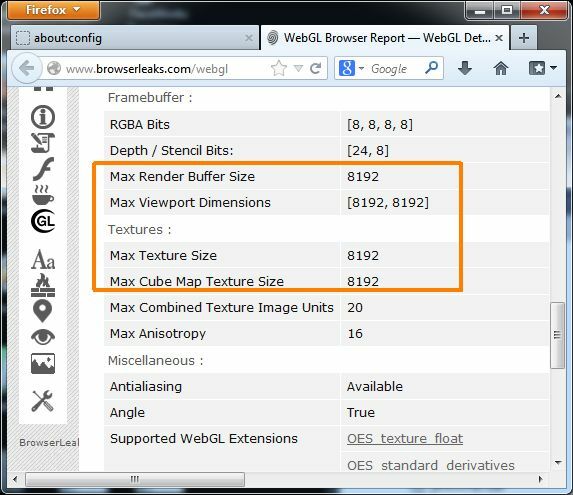 Another way to check the native OpenGL support is the max texture size (or max viewport size). With recent desktop OpenGL implementations, the max texture size is 16k or 16384 pixels. If you see something like 8192, ANGLE is likely enabled because 8192 pixels is the max size of a texture with Direct3D 9. Thank you for this info! Very helpful! For me switching to native mode disabled WebGL… HD6850 on latest beta catalyst ie. 13.6 beta 2. I have 16k textures when using Angle! Perfect, this enabled me to run WebGL over the discrete GPU (Radeon 8870) instead of over the internal Intel. Tough indeed, when not plugged into power and using the Intel (due to power saving settings in Catalyst) it’s better to keep using ANGLE, as I noticed some rendering issues otherwise.